So many devices, so few USB ports. The average computer doesn't come with nearly enough ports - but that doesn't mean you're stuck cycling through the devices you plug in. Get the MondoHub Master USB Hub for $54.99. 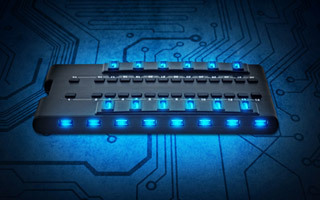 The MondoHub Master USB Hub gives you an extra 28 USB ports - 24 USB 2.0 and 4 USB 3.0 - to your computer. Yep, 28. Get super-fast charging and data transfer from the USB 3.0 ports, and challenge yourself to use all 28 - this hub will be fine, thanks to automatic occurrent protection. You can even switch any port on or off depending on whether you're using it at any given time. Never run out of USB ports again. Get the MondoHub Master USB Hub for $54.99.